The capital of Cuba, Havana is a fascinating old town and has been the star of many novels, movies and songs. It is rich in history and culture and holds a special fascination for many Westerners. 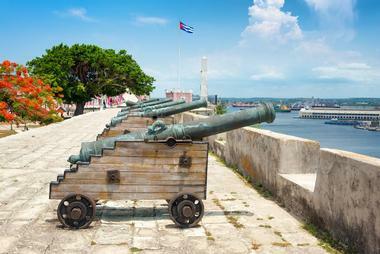 Its history is visible everywhere – from magnificent old squares such as San Francisco de Asis and famous promenade Malecón, to the old forts such as the Castillo de la Real Fuerza or Morro Castle. Please be aware of travel restrictions to Cuba for U.S. citizens. In the heart of beautiful Old Havana, on the shady cobblestoned Plaza de Armas, is one of Havana’s landmarks – the Book Market. Occupying about 100 square meters in front of the magnificent baroque Palace of the Captains General, the market opened first in the 1990s. Most of the roughly 20 book sellers have been there ever since, selling old, rare, and new books, naturally including a lot of publications by Hemingway and Castro, but also old photos and postcards and even coins. 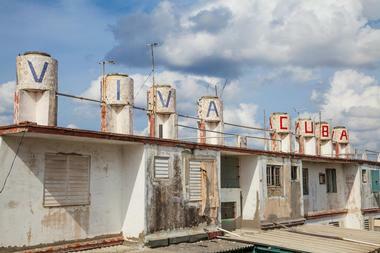 Some photos feature the old Cuba that is quickly disappearing and are quite beautiful. Most of buyers at the market are foreigners as locals find the prices unaffordable. Located on the Plaza Vieja on the top floor of the Edificio Gómez Vila is Havana’s Camera Obscura, an interesting optical device invented by Leonardo da Vinci that provides a live 360-degree view of the entire city of Havana. The panoramic view of the city is projected with a magnification factor of 30 onto a black screen through the camera’s peephole. The camera uses a turret that an operator rotates while changing the angle of the mirrors to provide a full view of the city. The operator accompanies different views of the city with a humorous and well-informed narrative. The camera was gifted to Havana’s Historian’s Office by the Council of Cadiz in Spain. The Castillo de la Real Fuerza (the Castle of the Royal Force) was completed in 1577 by Spanish authorities to protect Havana from attacks by pirates or rival powers and is one of the oldest stone fortifications in the Western Hemisphere. 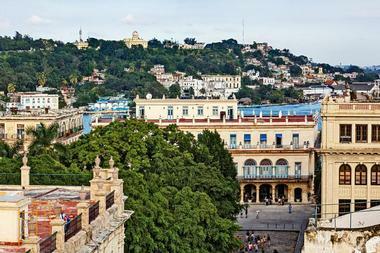 It is the main architectural element of Old Havana and a UNESCO World Heritage Site. The castle is located quite a distance from the entrance to Havana’s bay and did not fulfil its mission – English invaders took Havana in 1762 without exchanging any fire with the castle’s forces. For a while, the Castillo hosted Cuba’s National Archive and National Library and, after the Cuban Revolution, the government offices. Today, it houses a museum of Cuban ceramics, showcasing Cuban pottery from pre-Columbian times to today. There is a magnificent view of the city and the bay from the small café on the ramparts. 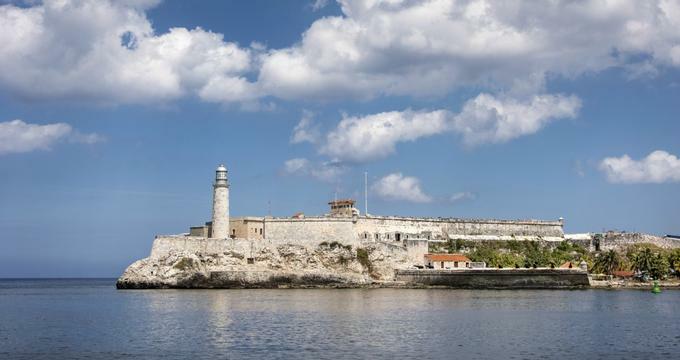 Located on the high promontory across the harbor from Old Havana, Morro Castle was built in 1589 to guard the entrance to Havana Bay. It is one of the city’s best known symbols and can be seen from miles away. The castle had a watchtower until the British destroyed it during their 1762 siege of Havana. The Faro Castillo del Morro lighthouse was built in 1846. El Morro used to house a lighthouse keepers’ school and today contains an exhibition on Cuban lighthouses. The cannons placed around the fortifications are in bad shape as they are rusted and neglected, but the walls are well preserved. The central barracks are four stories high and house a small exhibition on underwater archeology. There is a small turret at the end of the wall with spectacular views of the bay and sea pounding the rocky coast below. Tel. 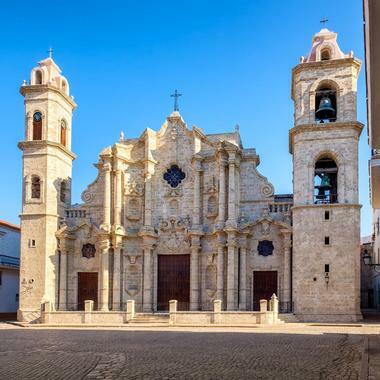 Located in the Plaza de la Catedral in the heart of Old Havana, the Cathedral of the Virgin Mary of the Immaculate Conception is probably the most beautiful of the eleven Roman Catholic cathedrals in Cuba and one of the oldest in the Americas. Its two mismatched towers frame the magnificent, highly ornate baroque façade. The Malecón is a broad seafront esplanade, promenade, roadway, and seawall that creates the most recognizable picture of Havana and is where everything that happens in Havana starts and ends. This 8-km-long waterfront stretches from Havana Harbor in Old Havana, through the Centro Habana neighborhood, all the way to Vedado. Its construction started in early 1900 and continued to develop with a quirky mix of architecture that ranges from neoclassical to art nouveau. Time, neglect, and the elements have done their job on the old buildings and many are now in dire need of restoration. 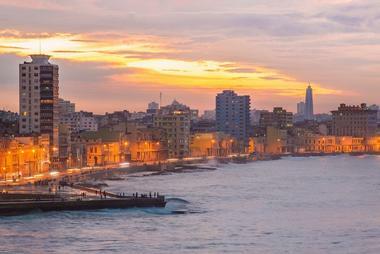 El Malecón was built to serve as a protective wall against the waves and northern winds, but quickly became a favorite spot for sunset walks along the harbor, meeting with friends, romantic encounters, or just soaking up the spirit of old Havana. Fortaleza de San Carlos de la Cabaña, or La Cabaña as the locals call it, is the third-largest fortress complex in the Americas. 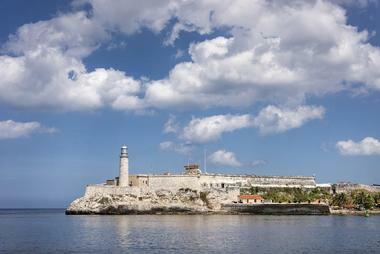 It is 700 feet long and rises 200 feet from the entrance of Havana Harbor, right alongside Morro Castle. 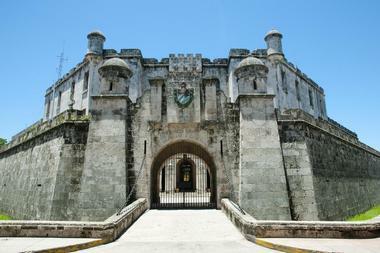 The fortification was built in 1763 by Spanish King Carlos III in order to improve the defense of Havana from landward side. During the independence wars, the fortress was used mostly as a prison and storage facility, and later as Che Guevara’s headquarters. Today it is established as the Parque Histórico Militar Morro-Cabaña and houses a number of museums such as the Museum of Arms, the Command Headquarters of Che Guevara, and a museum of the fortress’ history. When renowned Cuban artist José Fuster came back from a tour of European galleries, he decided to recreate the public art of Gaudi in Barcelona and Brâncu?i in Romania in his home country. He bought a small house in the village of Jaimanitas near Havana, decorated it with intricate, colorful mosaics, then moved to his neighbors’ houses, bus stops, doctors’ offices, fountains, gateways, benches, and anything else he could lay his hands on. After a decade, his village grew into a whimsical fantasy world that brings tourists by busloads to this once poor village. The village became known as Fusterlandia, and many other villagers became inspired to express themselves through colorful tiles, creating a never-ending, constantly changing art gallery that delights everyone who visits. The Gran Teatro de La Habana Alicia Alonso is a magnificent neo-baroque building located across the street from Parque Central in the Paseo del Prado in Havana. 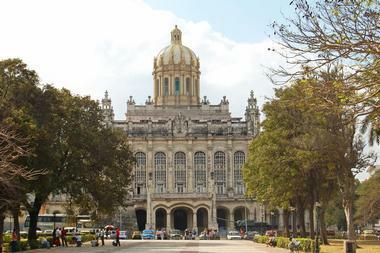 It was built and financed by Galician refugees as the Galician Centre of Havana, and it opened its doors in 1915. The theatre is home to the world-famous Ballet Nacional de Cuba, which was founded by Alicia Alonso in 1948, as well as to the Cuban National Opera. In the building are also the stately Teatro García Lorca and two concert halls: The Sala Ernesto Lecuona and the Sala Alejo Carpentier. 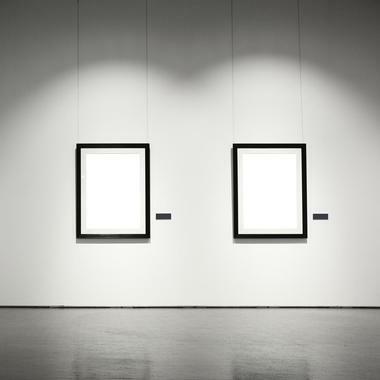 There is also a small art gallery, screening rooms, conference rooms, and rehearsal rooms for various dance groups. The theatre hosts the annual International Ballet Festival of Havana. Hotel Nacional de Cuba is a historic hotel located in the center of the Vedado neighborhood on a hill overlooking the sea with magnificent views of the city and the entire harbor. 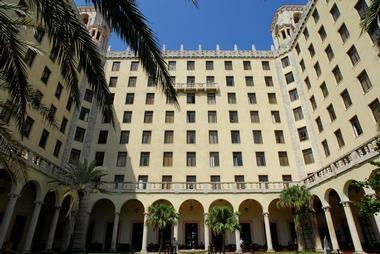 The hotel was opened in 1930, features fine art deco details and is surrounded by beautifully maintained gardens. 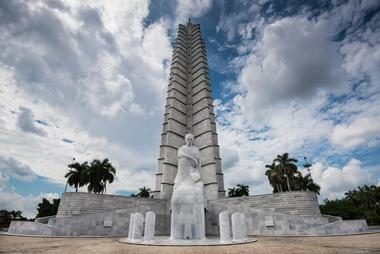 It is considered a symbol of Cuba, its culture, history, and national identity and has been declared a National Monument. The guns of the Santa Clara Battery that are exhibited in the hotel garden are part of a World Heritage Site. This beautiful 85-year-old hotel is known for its opulence and luxury and in its time hosted many important personalities and celebrities such as Winston Churchill, Frank Sinatra, Johnny Weissmuller, and Ava Gardner. 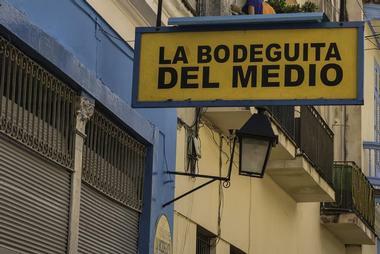 La Bodeguita del Medio started its life as a small, typical Havana grocery store where the owner started selling food and drinks to the regulars. When the regulars were Ernest Hemingway, Pablo Neruda, and Salvador Allende, the place quickly became a center of Havana’s cultural and artistic life. La Bodeguita del Medio was also famous for its wonderful new cocktail, the mojito. Today, it is a popular tourist hangout and watering hole, where people come to look at the names and signatures written on the walls, see the curious objects and photos that tell the story of its glorious past, and taste its famous mojito. 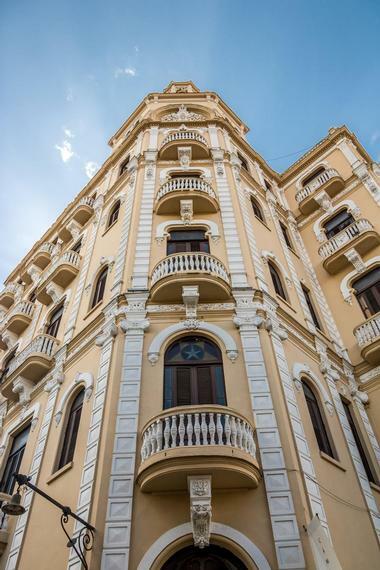 Miramar is Havana’s upscale residential district with large pre-revolution mansions, many foreign embassies, an international school, and several upscale hotels. While visitors come to Miramar to see Havana’s alter ego, which lies in such contrast to most of the city, and maybe to visit a few small museums and the aquarium, most come for the rich nightlife in places such as the famous cabaret Tropicana and the many international restaurants. At the west end of Miramar is Club Havana and the area’s only beach as well as the Marina Hemingway, where visitors can book a boat excursion or diving trip, and the beautiful, old Miramar Yacht Club. 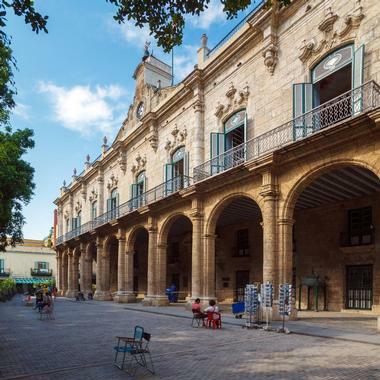 The City Museum is located in the beautiful 1770 baroque palace on the west side of Plaza de Armas, the Palacio de los Capitanes Generales, on the site of Havana's original church. The rock for the palace was brought from a nearby quarry in San Lazaro. This old beauty is today the city’s most comprehensive history museum, but throughout its illustrious history it has served many diverse purposes: It was the residence of the captains general of Spain, the base for the US military governors, and briefly even the presidential palace. 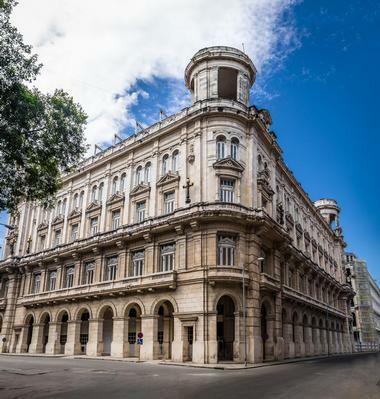 Now the City Museum, it features some wonderful exhibits, including a marble statue of Christopher Columbus in the courtyard, a lot of ornate period furniture, an old 19th-century carriage and many photos of Havana’s turbulent history. Tel. The Museum of the Revolution is located in Old Havana in what used to be the presidential palace of all Cuban presidents through history. Completed in 1920, the palace’s opulent interior was decorated by Tiffany's of New York. The magnificent Room of Mirrors is a copy of the same-named room at the Palace of Versailles. The top floor of the museum houses Cuba's pre-Columbian artifacts and as you go down, the exhibits become more and more recent until you reach to the first floor, which features Castro’s regime. There are also interesting exhibits on the Moncada Attack in 1953 and on the life of Che Guevara. The tank in front of the building is an SAU-100 tank used by Castro during the battle of the Bay of Pigs. Tel. The Hemingway Museum Finca Vigía, or ‘lookout house’, is a lovely Moorish house in Havana’s working-class suburb of San Francisco de Paula, which Hemingway first rented with his third wife Martha Gellhorn and purchased in 1940. The house is located on a hill with magnificent views of Havana and the bay. Hemingway was well liked by his neighbors - he went fishing with them and taught the kids to play baseball on his property. He wrote nine of his novels in Finca Vigía, including two of his most popular – The Old Man and the Sea and For Whom the Bell Tolls. He lived in Finca Vigía until 1960, when he left Cuba. The National Museum of Fine Arts of Havana showcases Cuban art from Spanish colonial times to this day. The museum occupies two buildings – the Palacio de Bellas Artes (Palace of Fine Arts), which is dedicated solely to Cuban Art, and the Palacio del Centro Asturiano (Palace of the Asturian Center), which features international art. Art is an important part of Cuban culture and the collections in the Palace of Fine Arts show some of Cuba’s most influential artists such as Guillermo Collazo, René Portocarrero, Wifredo Lam, Leopoldo Romañach, Federico Beltrán Masses, Víctor Manuel, Jose A. Bencomo Mena, Domingo Ramos, Manuel Vega, and Raúl Martínez. Some of the most notable exhibits in the magnificent architectural masterpiece Centro Asturiano is the Spanish collection with an El Greco canvas, a 2000-year-old Roman mosaic, 5th-century BC Greek pots, and the British Room with a beautiful Gainsborough canvas. Museo Napoleonico is located in the Villa Fiorentina, a beautiful Renaissance-style palace built in the 1920s and a home of Orestes Ferrara. The museum features personal collections of Orestes Ferrara and Julio Lobo and contains more than 7,000 objects - arms, furniture, bronzes, sculptures, paintings, porcelain, books, coins, engravings, autograph letters, and personal items that belonged to Napoleon and his entourage. All exhibited artefacts and various memorabilia were bought at auction in the early 20th century. The collection is considered the most significant Napoleonic collection in Central America and was declared a national heritage. The museum was opened to the public in 1961. 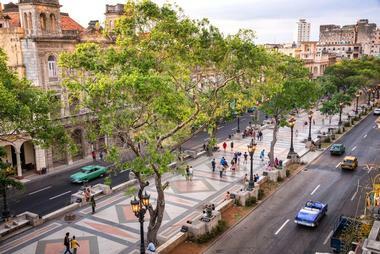 Paseo del Prado is one of the most popular streets in Havana, stretching between Old Havana and Centro Habana. Officially called Paseo Marti and Prado by the locals, this 2-km-long avenue was the first one built outside the old city walls. Its construction, which started in 1772 and was completed in the 1830s, was planned as a great promenade like those in Barcelona or Paris. Along the promenade one can see La India Fountain, El Capitolio de Cuba, the Matrimonios Palace, the Fausto Theater, the neoclassical National School of Ballet, the renowned school of Ballet of Alicia Alonso, eight bronze statues of lions, Central Park with a sculpture of José Martí, Esquina Caliente, where the locals talk about baseball, the Capitol terrace, and Fraternidad Park with numerous busts of past leaders of the Americas. 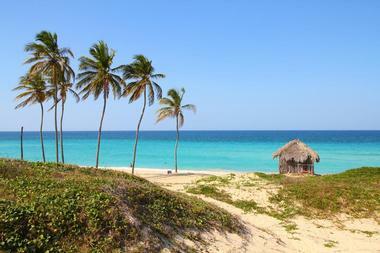 Playas del Este is Havana’s own 9-km-long Riviera. It starts about 18km east of Havana at the Bacuranao resort, continuing through the towns of El Mégano, Tarará, Boca Ciega, Santa María del Mar until it reaches Guanabo. Lined with shady pine trees, during the hot summer months Playas del Este becomes the center of social life, the place where the whole of Havana descends to cool off and relax on the fine white sand and azure waters of the Atlantic. Don’t expect the facilities of similar beaches at the fancy Cuban resorts of Cayo Coco or Varadero. The place is real Cuba, unpretentious and unadorned, with large, ugly Russian-style hotels and small, seedy restaurants lining the beach, which ultimately is what makes it so attractive for tourists who want to see how real Cubans spend their free time and enjoy themselves. Plaza de la Revolución is a massive square in Havana's “new city” that is located on a small hill and from which, like in Paris’s Place de l’Étoile, broad avenues fan toward the Vedado, Río Almendares, and the Parque de la Fraternidad. The square is the center of the Cuban government and is surrounded by large, colorless utilitarian buildings built in the 1950s, such as the Ministerio del Interior with its enormous mural of Che Guevara, the 1957 Biblioteca Nacional José Martí, and the Teatro Nacional de Cuba. All big political rallies are held on Plaza de la Revolución as are some not-so political events, such as a Mass celebrated by Pope Jean Paul II in 1998 that was observed by almost one million people. Real Fábrica de Tabacos Partagás is one of Havana's oldest and by far most famous cigar factories. 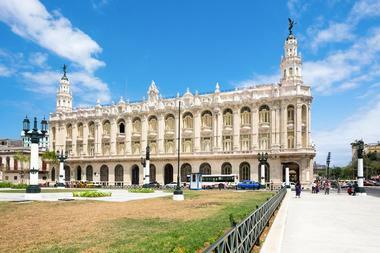 It is located in Centro Habana, across the street from the Capitol Building, in a landmark historic neoclassical building. The factory was founded by Spaniard Jaime Partagás in 1845. It is still fully operational and about 400 workers labor for 12 hours a day, hand-rolling world-famous cigars such as Cohibas and Montecristos. 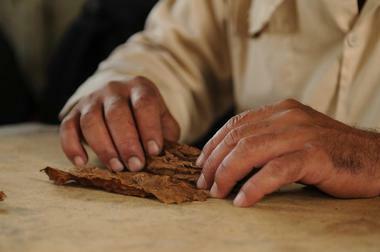 Tours of the factory start on the ground floor, where the tobacco leaves are sorted and unbundled. The tour continues to the upper floors, where the tobacco is rolled, pressed, labelled with a band, and carefully placed in a box. Naturally, the factory shop is extremely popular. 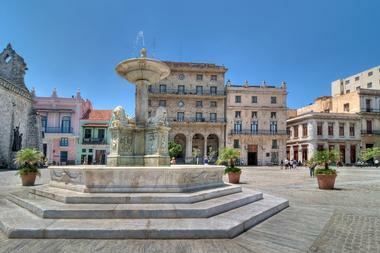 San Francisco de Asis Square is an ancient cobblestoned plaza overlooking Havana Harbor. In the 16th century it was a site of a market visited by Spanish sailors arriving on galleons on their way to the Indies. In 1608 the church that was built on the square pushed the market to the neighboring square. The cobblestones so admired today were added in 1990s during the latest renovation, when Giuseppe Gaggini’s beautiful 1836 Fountain of Lions was added as well. The cruise terminal is on the eastern side of the square, as is the domed 1909 former commodities market Lonja del Comercio, now housing offices for foreign companies working in Cuba. The building’s central atrium and magnificent futuristic interior are open to visitors. 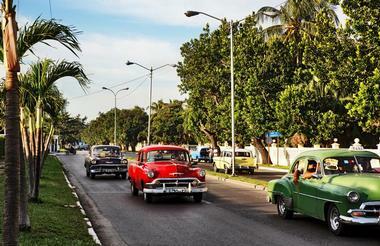 Exploring Havana and its surrounding towns can be great fun with the right guide and the right transportation. Going around in a taxi is fun and comfortable and, with the right driver, you can discover a number of the city’s hidden nooks and crannies, especially the interesting ‘casa particular,’ or restaurants with great local food. 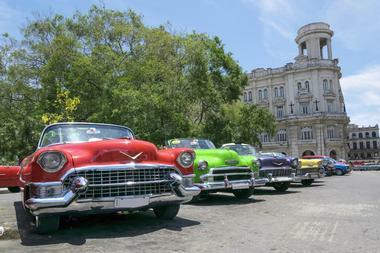 Havana Taxi Tours is an online service which connects taxi drivers with visitors, helps with introductions, and shows the type of vehicle, price lists, and recommendations from previous clients. The drivers are paid directly and visitors can hire the same driver for further trips if they are satisfied. 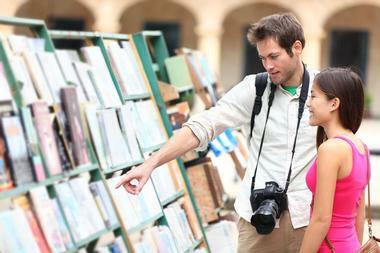 The trips range from two-hour tours of Havana to visits to the nearby towns of Trinidad or Santa Clara. 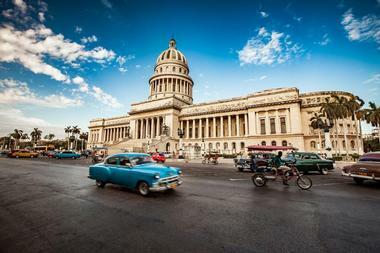 Dominating the Havana skyline, the Capitolio Nacional Cuba is a magnificent part of Cuban history. A seat of Cuban pre-revolutionary legislature, since 1960 the Capitolio Nacional has been home to Cuba’s Ministry of Science, Technology, and the Environment, while the National Library of Science and Technology is located in the back of the building. The ground floor is open to the public. Designed by the architects Eugenio Rayneri and Raúl Otero in the neoclassical style, the Capitolio Nacional was completed in 1929. Its main features are massive granite columns, a huge stairway lined by statues that leads to an enormous 150-foot-high entrance, and a spectacular 300-foot-high dome with a sculpture of the god Mercury on its top, a replica of an original Florentine 16th-century sculpture.